As far as wholesale warehouse shopping experiences go, there's something distinct about culture of Costco that makes it stand apart from the rest. At the heart of the retailer, there's a thriving compassionate culture based on an ethical mission derived from clear vision and values. If we do these four things throughout our organization, then we will realize our ultimate goal, which is to reward our shareholders." When you know what you're looking for, it's easy to see that the Costco Mission is achieved every day by the Costco employee team. What's not so easy to see, but is important to remember, is that the Costco mission was developed by its founders. Outside of the state of Washington, Jeffrey Brotman might be the less famous co-founder of Costco, but that doesn't mean he was the less influential co-founder. When looking at Brotman's life experience, it's easy to see how much influence he had on the Costco Code of Ethics which is a key part of its corporate mission, vision, and values. Jeffery Brotman was born in 1942 to Bernie and Pearl Brotman in Tacoma, Washington. Jeffery's father was a retailer. During childhood, Jeff learned the core value of helping those in need who couldn’t help themselves. He was raised Jewish and his personal values were influenced by his Rabbi in and his parents. Like his father, Jeff played football in high school, where he was influenced by discipline, teamwork, and leadership. Jeff attended the University of Washington and received a degree in political science in 1964. He practiced law briefly while finishing his studies, but also worked his way through school in a retail job at Bernie’s Clothing Store. Even though he had attended law school specifically to avoid following in his father’s retailing footsteps, Brotman ended up opening a chain of men’s clothing stores with his brother Michael. He was an investor in other retail businesses lie Starbucks and Garden Botanica, but it wasn’t until he founded Costco with James Sinegal that he was able to use his leadership vision and values to create major success in the business world. James Sinegal was born January 1, 1936, to a Catholic family. As early as can be remembered Jim wanted to become a doctor, but his low grades in school prevented him from being able to get into medical school. Sinegal enrolled in San Diego Junior College in 1953, and then transferred to San Diego State University after discovering that he liked learning about things that he cared about. Sinegal worked his way through college as a bagger at the FedMart retail chain. Just a few years after starting at the store as a mattress unpacker at FedMart, Sinegal became the store manager. He loved his new position so much that he quit his schooling in order to spend all of his time at FedMart, where he rose to the rank of Vice President. Despite never receiving a college degree, Sinegal worked his way up to become the vice president in charge of merchandising and operations at FedMart. Sol Price, the founder of Fed-Mart, decided in 1979 that he wanted to start a new venture and took Jim with him. Together the two started Price Club and during the process, Sinegal learned about the startup of a retail business. 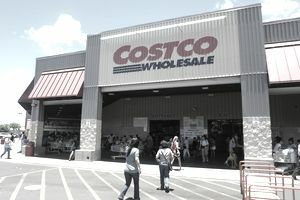 Price Club is credited as being the first retail big box warehouse concept store, which of course, was the natural springboard from which the Costco chain would be launched. Sinegal learned much from his mentor Sol Price. But in an interview with the New York Times, Price admitted that he learned from Sinegal as well. Sinegal did eventually part ways with Price and the Price Club. Besides his experience there, Sinegal held an executive position for Builders Emporium, and started his own consulting firm which specialized in brokering food and non-food products. All of this learn-by-doing experience was the setup for the founding of Costco in 1983. It is worth noting that by the time Sinegal and Brotman founded Costco, Sinegal already had 29 years of hands-on experience in all aspects of retailing. Because he lived it and loved it, Sinegal was able to lead it. That refers to the legendary Costco employee culture, of course, which Sinegal led with the kind of clarity and compassion that comes only from experience. In the case of Costco Wholesale Warehouse, apparently two founders were better than one. Using counter-intuitive retailing strategies Costco has become a wildly popular retail phenomenon around the world that has been referred to "The Costco Craze," The retail industry innovations that are credited to Costco include the addition of fresh food, eye-care clinics, pharmacies and gas stations to the retail warehouse customer experience.